Our Ladye Star of the Sea, Greenwich. William Wardell (1823-1899), with work by A. W. N. Pugin, E. W. Pugin and others. 1851, with later embellishments. Kentish rag with Caen stone dressing for the doorways and windows, and Welsh slate roofs. 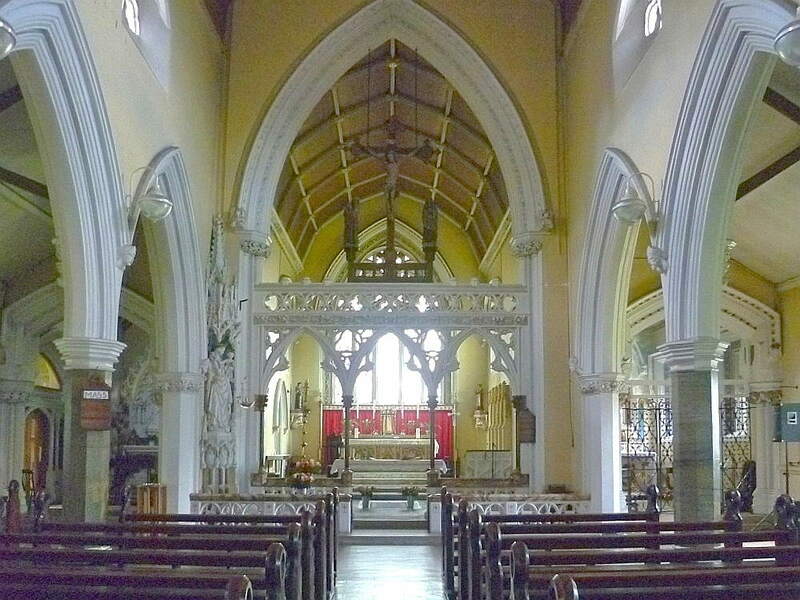 Within, polished Purbeck marble columns, stone rood screen, wrought iron gates to Baptistery and Chapel of the Blessed Sacrament, etc. Crooms Hill, Greenwich, London SE10. Father (later Canon) Richard North (1800-1860), priest of the Catholic "mission" in Greenwich, had officiated at the precursor chapel, and was the driving force behind the building of the new church. His object was to serve Catholics among naval pensioners at the nearby Greenwich Hospital, and the many poor Irish labourers living locally, and engaged in market gardening. The location itself is splendid: "The beauty of the western side of Greenwich Park, and the steep declivities in which Blackheath terminates, is quite remarkable," wrote the social researcher Charles Booth at the end of the Victorian period (52). 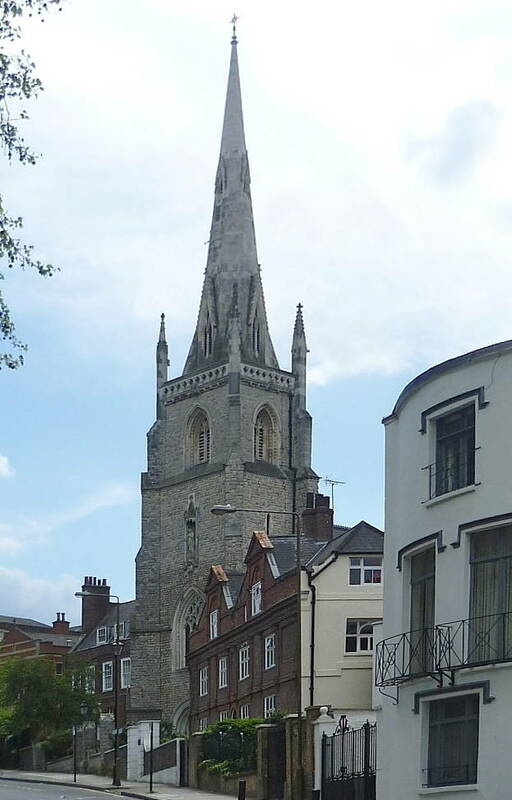 The church, despite being squeezed into an awkward space, has a robust presence on the hill thanks to the sturdy tower over the entrance, with its "powerful polygonal turret" (Cherry and Pevsner 248), and lives up to its name by making a notable landmark. All in all, Booth descibes it as "a beautiful edifice, partly old, on the completion and adornment of which much has been spent" (52). Even in his day it still had a strong connection with naval life: he reports that the priests would "visit the training-ship Dreadnought where there are usually forty or fifty Catholic boys who come under their care. This represents a large part of their work" (53). But by now, Booth adds, most members of the congregation, which included many converts, were quite affluent. The interior of the church, with a close-up of the chancel. As for the overall design of Our Ladye Star of the Sea, Wardell has used a "simple Puginian plan with with six-bay aisled nave, two-bay chancel with chapels; Dec [=Decorated; the Gothic architecture of the 14c] details" (Cherry and Pevsner 248). 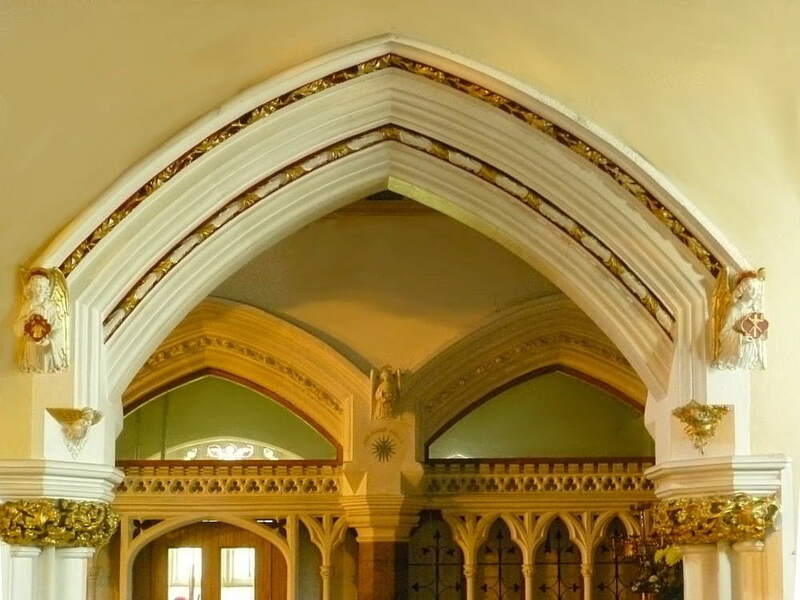 A. W. N. Pugin contributed to the internal decoration both through his strong influence on Wardell, and by his own work on the interior. Indeed, it has been suggested that both the chancel and the adjacent Blessed Sacrament chapel (see Part 2) were "entirely" designed by Pugin (Egan, "Mrs Jane Pugin," 23); his eldest son Edward also did some work there at a later date. 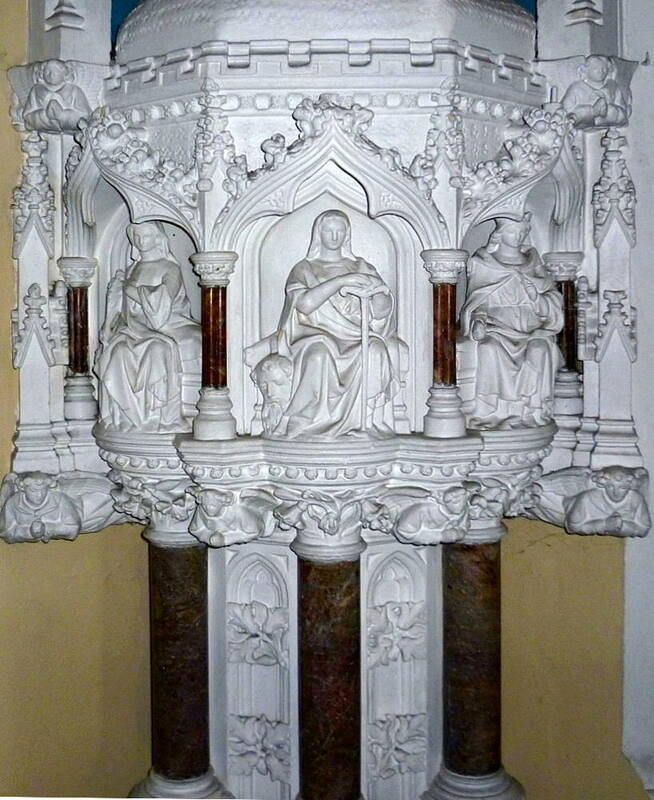 As well as knowing Wardell, the Pugins were closely connected by marriage with the Knills, a prominent Catholic family who had moved into the neighbourhood by mid-1850, and began generously supporting the church — Jane neé Knill had become Pugin's third wife, and hence Edward's step-mother, in 1848, the year before its basic structure was completed. The Knills therefore paid for "much of the work that Augustus Pugin had designed for the interior of the church" (Egan, "Mrs Jane Pugin," 24). 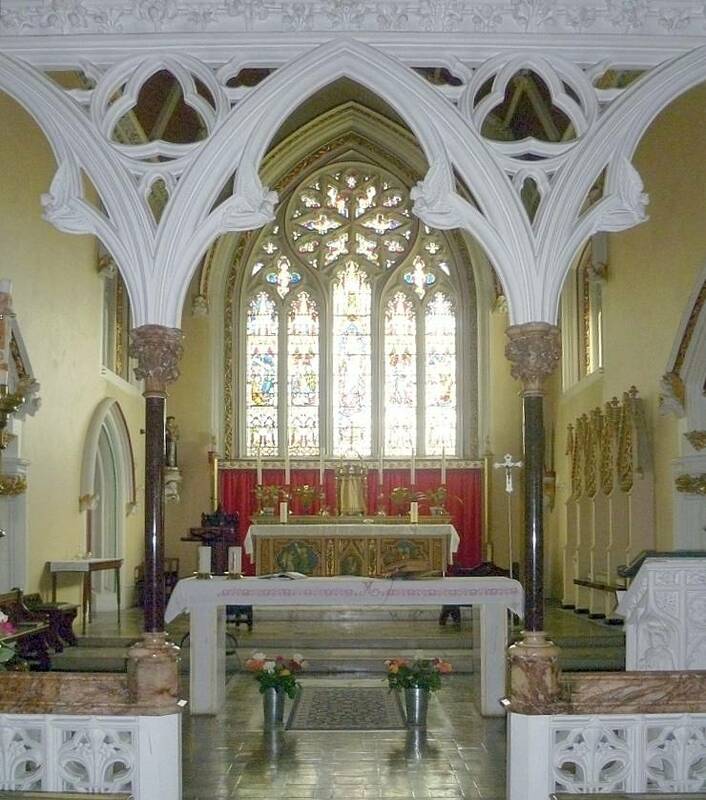 However, this might not have included the rather dramatic stone rood screen, which attracted attention at the time of the opening in December 1851, and is considered "a rare survival in a Catholic church" (Egan, Church of Our Ladye). According to the same source, the columns supporting it and the communion balustrade from which they spring were probably added about ten years later, when Edward Pugin was involved with the church, but, again, no definite attribution can be made. Seen to the right of the chancel is a low pulpit, most probably designed by Augustus Pugin, perhaps cut down from its original size. The chancel's panelled roof is echoed in the chapels. 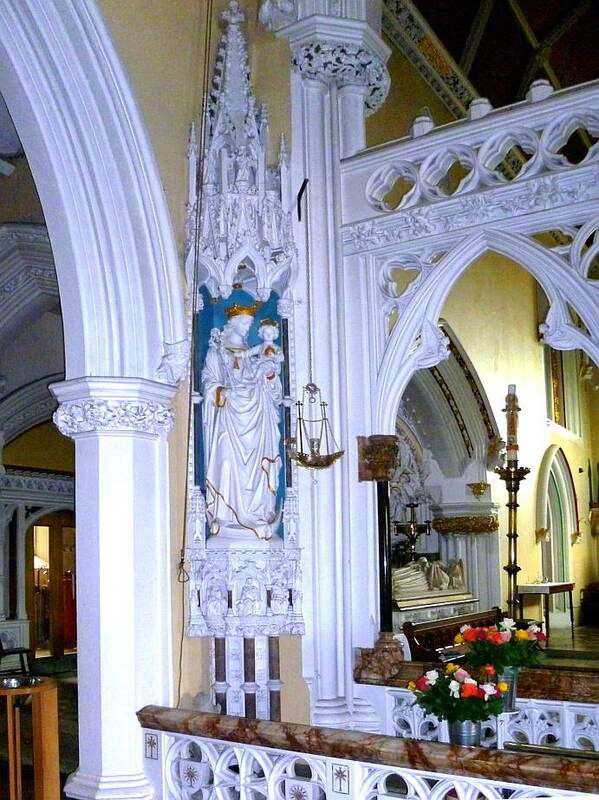 Left: The High Altar, with scenes of the Annunciation and Visitation flanking the Virgin Mary and the infant Jesus. Right: Sedilia, the seats built into the wall of Catholic churches near the altar, for the presiding clergy. The High Altar differs in its details (the figures on the front) from Wardell's original drawing of it, yet the final work is thought to have been his (see Egan, Church of Our Ladye). Wardell also made a preparatory drawing of the attractive stone sedilia and piscina, and this is similar to what we see today, so these too should probably be credited to him — although the possibility of Pugin's direct or indirect influence is always there. 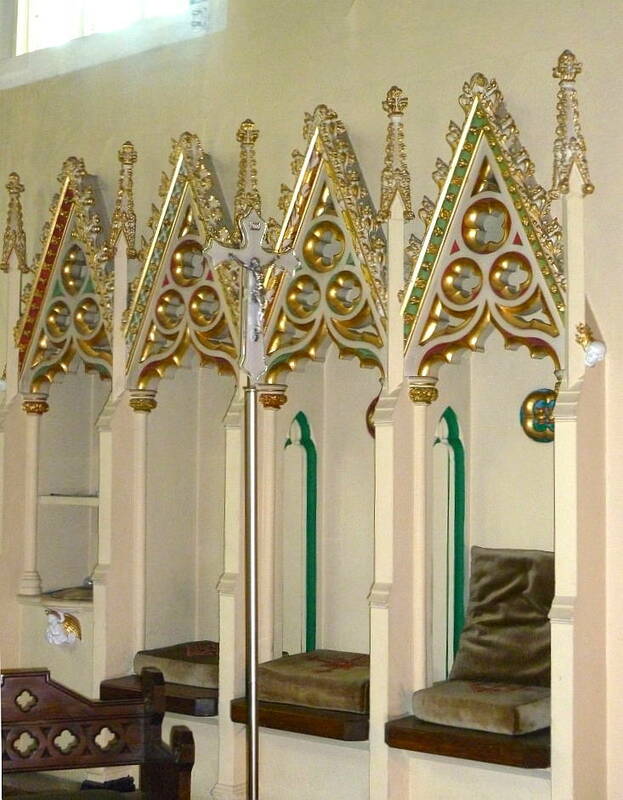 They do show a lighter touch than Wardell's rood screen, which must have seemed heavier and more obstructive before it was raised to a greater height. But even that is of doubtful attribution, as suggested above, and was anyway to some extent a hybrid, considering the changes made to it at a later date. 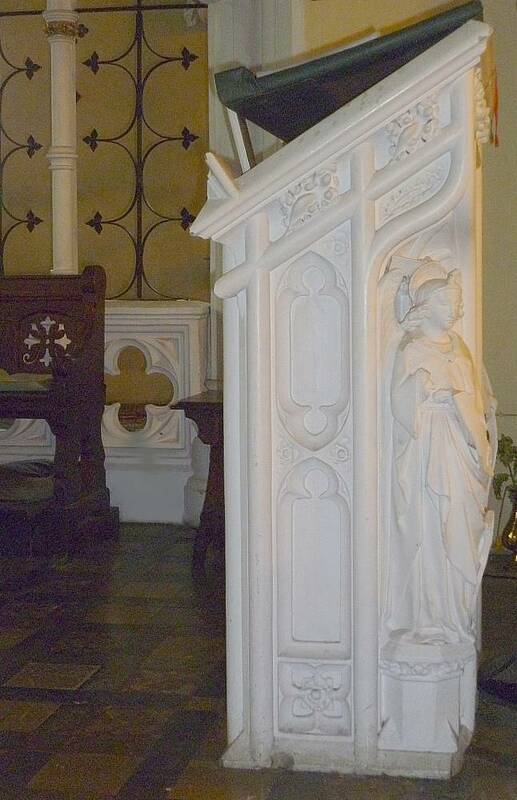 Left to right: (a) Angel carving on the side of the pulpit. (b) Arch between chancel and Lady Chapel. (c) Another angel carving, this time in profile. Some of the special features of the church have been lost, or at least covered, over the years. Stencilling on the chancel roof has been painted over. The original panelled roof of the nave is hidden by the flat ceiling installed in the 1960s A fresco above and on each side of the chancel arch has been painted over as well, and cork floors cover the original colourful Minton tiling. In the 1960s too a modern organ loft was added at the west end. 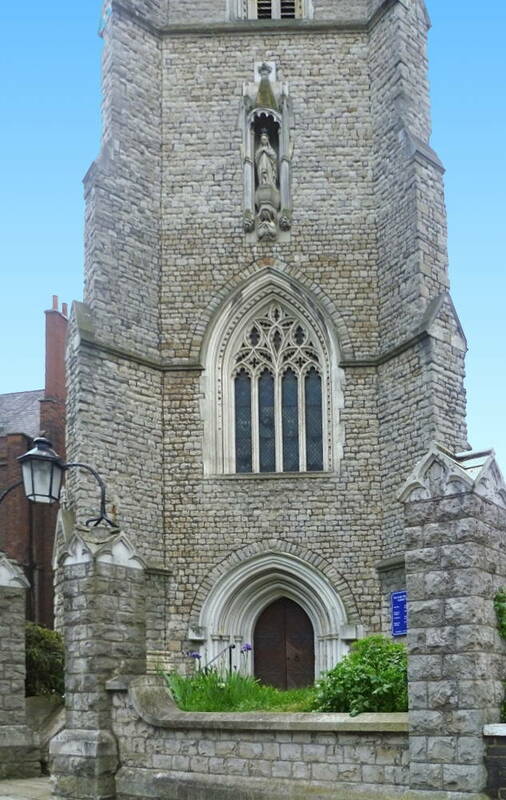 As the listing text puts it: "Very tall tower arch now partly blocked by organ" ("Roman Catholic Church of Our Lady Star of the Sea"). But many beautiful details remain, as seen here. 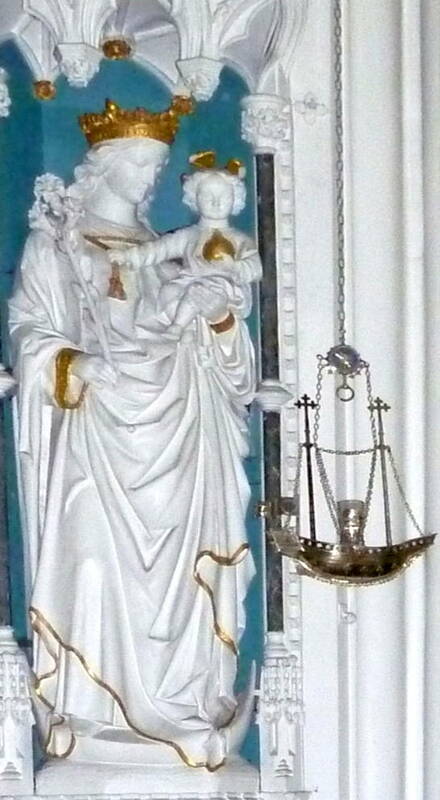 Left to right: (a) Statue of Our Ladye with the infant Jesus, set diagonally in a tall canopied niche to the left of the chancel. (b) Close-up of the figure and the lamp. (c) Seated statues of Ruth, Judith and Queen Esther, at the base of the statue. Also seen here is the beautiful stone-carving of the open rood screen above, the columns, and the two sets of stone "rails." 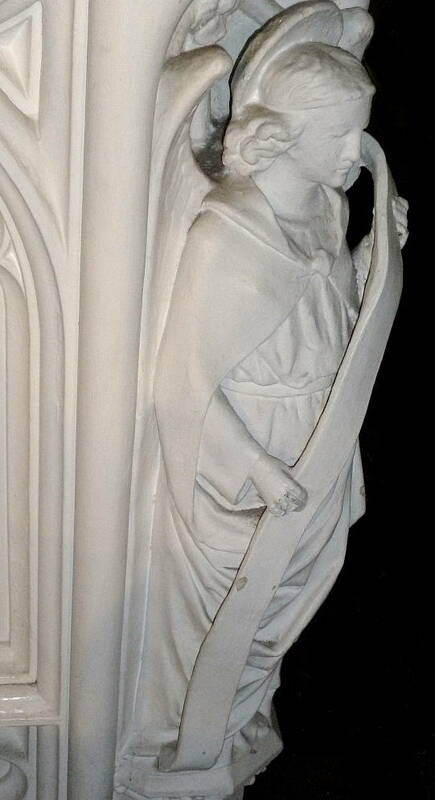 The statue is likely to have been from Pugin's design, and undertaken by craftsmen working for Myers (Egan, Church of Our Ladye). In front of the figure hangs a delicate silver votive lamp in the shape of a ship (a traditional and symbolic piece of church metalwork, signifying that the church is an ark of salvation), made to Pugin's design by John Hardman (see Cherry and Pevsner 248, Martin 83), and presented to the church by Mary Knill, wife of Jane Pugin's cousin Stuart (later Sir Stuart Knill, and Lord Mayor of London). Supporting Our Ladye, the three strong female figures from the Old Testament — Ruth, Judith and Queen Esther, all of whom prefigure Mary — are very finely carved. Ruth is shown with a sheaf of corn, Judith with the head of Holofernes, and Queen Esther wearing her crown and gesturing, as if speaking wisely to her king. Whereas Judith and Esther saved their people, the first by killing the enemy and the second by winning him over, and thus serve as somewhat dissonant types of the Virgin, Ruth's humble loyalty perhaps makes her a more suitable prefiguration of Mary. Booth, Charles. Life and Labours of the People in London, Third Series, Religious Influences. Vol. 5: South-East and South-West London. London: Macmillan, 1902. Google Books. Web. 5 June 2012. Cherry, Bridget, and Nikolaus Pevsner. London 2: South. The Buildings of England series. London: Penguin, 1983. Print. Egan, Michael. Church of Our Ladye, Star of the Sea, Crooms Hill Greenwich: Notes for Visitors. Leaflet kindly provided by Michael Egan. Print. ____. "Mrs Jane Pugin and Some London Relations." True Principles: The Voice of the Pugin Society. Vol. 2, No. 4 (Summer 2002). 22-24. Print. ____. Private Correspondence, kindly photocopied for the author by Father Kevin Robinson at the church, and drawn on here with Michael Egan's permission. Martin, Christopher. A Glimpse of Heaven: Catholic Churches of England and Wales. London: English Heritage, 2006. Print. "Roman Catholic Church of Our Lady Star of the Sea." British Listed Buildings. Web. 5 June 2012.